Katie’s surgery went well yesterday. The surgery was successful and the only issue is the pain. The Doctor felt that the tumor removal, treatment of the area, bone graph and creation of the internal steel brace went very good. She did have major pain issues once the anesthesia wore off, and had a reaction to first IV pain medication that caused itching all over. They changed to a different medication after that, but started off with a very low dose and then very gradually increased. She is still struggling with tremendous pain and they have yet to find the right pain medication combination. They recently switched to a third medication, because the second was requiring such high doses that her blood pressure was dropping to a concerning level. Katie still has another day or two in the hospital then home for recovery. She will not be allowed to put more than 30 lbs of weight on that leg for six weeks, and then she will go back to the doctor for X-rays to see how the bone graph is holding. Unfortunately, the weight restrictions mean that Katie will be on a walker, and need a wheelchair for longer distances. Janie is with her in LA. I made a quick trip to Tennessee last week. Being away from Carly for four days made me realize how much progress she is making! She really is doing great and working hard in all of her therapies! Last week she continued to improve in speech and her handwriting also progressed. She is still struggling with memory issues but is doing better with visual cues. In occupational therapy, she went on an outing Susan, her therapist. They went to the mall and worked on having Carly navigate her way around the stores, asking for directions and help to find certain items. She did very well, and naturally enjoyed the mall as therapy! This afternoon Carly and Hadley are going grocery shopping for the ingredients to bake pies, as an extra activity for speech therapy. Carly has selected her award-winning Pecan Pie recipe to make! 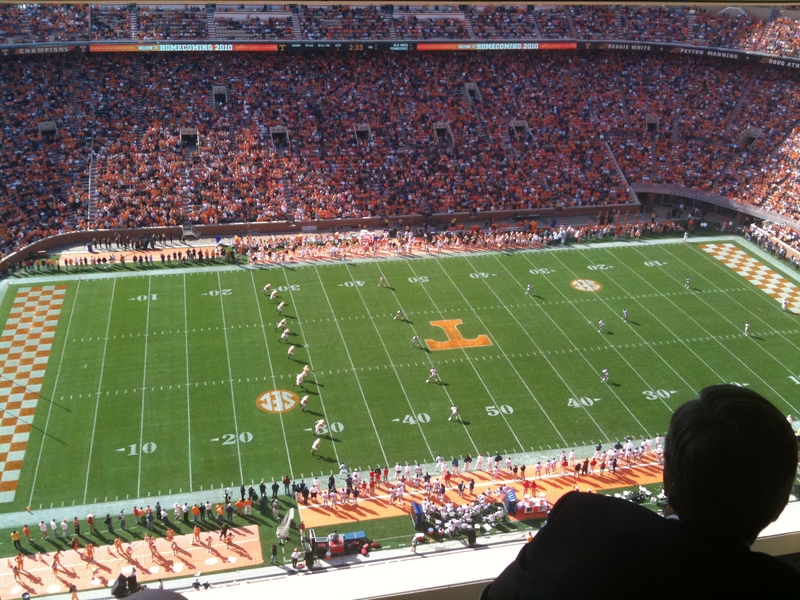 It’s Football Time in Tennessee! Last weekend was the University of Tennessee homecoming. 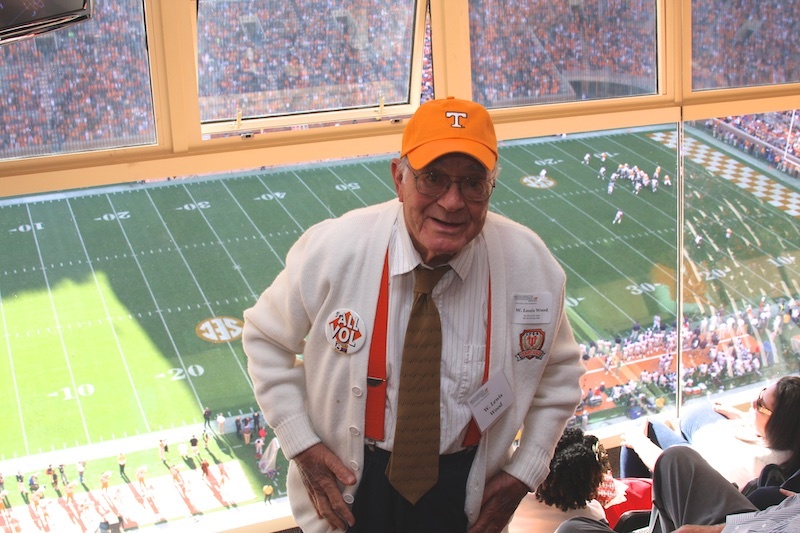 Lewis Wood (Janie’s father) attended UT in 1943 left to serve in WWII and returned in 1946. He graduated in 1949 from the College of Engineering (he is in Orange Cap in center of photo). 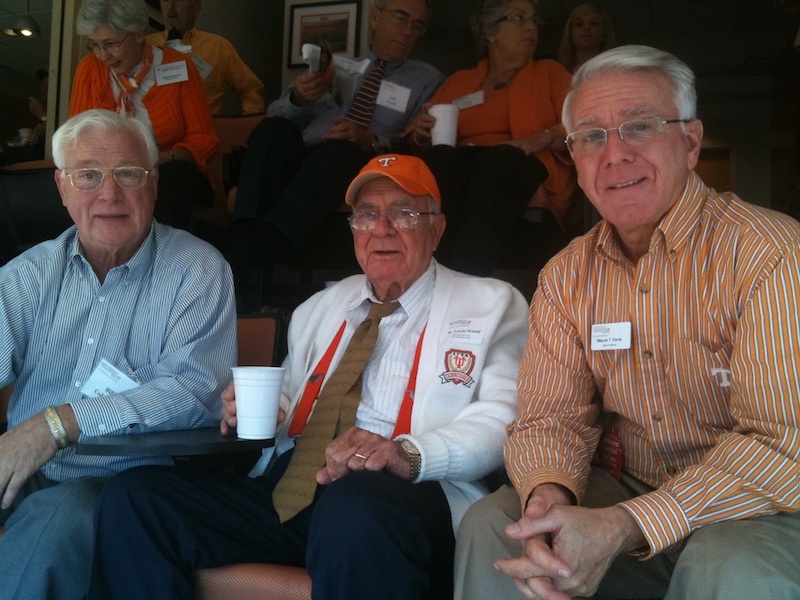 He has not attended any UT functions for some time due to Jane’s health (his wife of 64 years). The College of Engineering was holding a BBQ before the game and Lewis was the oldest graduate able to attend. It was a great time for him to relive some great memories from his past. The College of Engineering totally hooked us up with tickets in their Skybox. 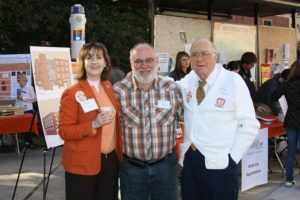 Lewis enjoyed talking to other engineering graduates, spending time with several of the Professors and the Dean of the College. 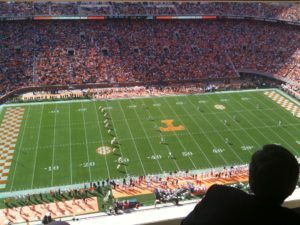 The Vols played great, won the game with a large margin and sang Rocky Top all afternoon. We also attended the Kappa Sigma Reunion on Friday night in Gatlinburg. It was a wonderful weekend with a lot of driving but good conversation, great activities and beautiful weather in Tennessee. Praise the Lord for the many blessings he continues to shower us with. Pray for Katie’s pain to come under control and for her healing, that she will be able to travel to Salt Lake City next week for the big Thanksgiving celebration. Pray for Carly’s continued progress and specifically in her memory issues. Pray for safe travel for everyone next week. The Lyons are converging on SLC along with our entire family.